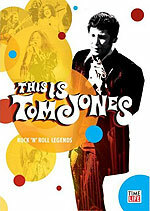 CD review: "This is Tom Jones"
Watching these episodes of Tom Jones' old ABC talk show out in a new boxed-set three-DVD best-of collection makes one thing very clear: When Mike Myers was planning the first Austin Powers movie, Jones' show had to have served as at least partial inspiration for its over-the-top choreography on some of the songs Jones sang. Of course, watching these shows ( which aired from 1969-1970) in 2007 brings a different reaction than that aimed for when they first aired: The set-piece numbers on Jones' show today seem unintentionally hilarious, in light of the Austin Powers films. But the show also illustrates the fact that Jones was one of the most versatile singers of the 1960s and early '70s, comfortable in both the traditional crooner's school and in rock 'n' roll. His show celebrated both the old and new in music, with guest appearances by everyone from Glen Campbell to the Who to Arehta Franklin. And Jones was absolutely at home in every setting, whether gently singing a salon song with Burt Bacharach or rocking out with Little Richard, belting out a show tune with Leslie Uggams and keeping up with Janis Joplin. Perhaps only Sammy Davis Jr. and Bobby Darin ever rivaled Jones in his ability to switch from seemingly disparate style to style without ever missing a beat. It's certainly difficult to imagine that many singers could sing a medley of "In the Midnight Hour" and "Danny Boy" in the same set, or hold their own with the above list of singers. While the featured episodes shows are shown in their entirety (eight half-hour shows are included in this release), almost everything here is either music performance or comedy sketch. Jones is a gifted singer, and not so much in the interviewing department  and his show played to his strengths.